National Association of the Deaf & Hard of Hearing (NADH) is non-governmental, acting-oriented, non-profit organization that works with deaf or hearing-impaired people. It was duly registered with Government of Nepal under C.D.O. office and social welfare council (SWC) in 1996 with a view to unlit the condition of the most backward, exploited and extremely poor deaf and Hard of Hearing people in rural and urban areas of Nepal. The disabled people face sheer discrimination in every aspect of their life. Most of the disabled persons in Nepal are illiterate, extremely poor and ignorant of their social status. It is estimated that there are more than 700,000 deaf people in Nepal. This number is 10% of total disabled persons. It reveals that the figure of the deaf is comparatively higher than all other disables. Being deaf means not being able to here. Deaf people have a language of their own through which they have developed their own culture. Deaf people use sign language as their primary means of communication. Sign language is used in the same way as hearing people use spoken language but only then when it is developed well. The main obstacle of the deaf is that they cannot hear & speak. Except this, they can fit to do any work of their life. They can play an active role in the society with the help of sign language interpreters. Even though, society is not ready to respect them as their equal member. Due to dearth of education and consciousness, they are hated and humiliated in the society and are not involved in any responsible job, which has been a main cause of their disappointment. While concerning the deaf education, no clear governmental policies regarding the provision of educational facilities to the deaf populace has been formulated yet. In order to defend their language, culture and to fight for equality and justice in society, these people united in clubs and established associations to conduct various activities for overall development of this community. To protect the rights of Deaf and Hard of Hearing people. To collect statistics of the Deaf and Hard of Hearing people in country. To develop sign language for the Deaf and Hard of Hearing. To work towards developing self-reliance among the Deaf and Hard of Hearing, people by involving them in different vocational activities and skill developments training. To achieve the above objectives various programs should be conducted in coordination with the agencies concerned. Conducting various vocational training programs to be makes the Deaf and Hard of Hearing people self-reliance. Conducting Nepali sign language classes for the deaf and hard of hearing people and to propagate sign language. Providing financial assistance to local association of the deaf as far as possible. Developing sign language curriculum and publishing sign language dictionary. Raising public awareness through bulletins and TV program by collecting news relating to the Deaf and Hard of Hearing people. Conducting leadership training for local association of the Deaf and Hard of Hearing people. Working in cooperation with the Nepal Ear Foundation (NEF), for the treatment of hard of hearing people. Produce Nepali sign language Interpreters for the Deaf and Hard of Hearing people. Coordinate with the Welfare Society for Hearing –Impaired (WSHI), an educational institution for the Deaf people, for the educational development of the deaf. Making effort for the induction of Deaf and Hard of Hearing people on the governmental and non-governmental agencies. Coordinating with government agencies concerned in framing policies and legislation for consolidating the rights and welfare of the deaf and hard of hearing people. Deaf and Hard of Hearing people extremely need sign language, education, awareness and vocational training. An effort made by Government, Nepal for the development of deaf and hard of hearing people seems minimum. Because radio awareness programs conducted by Radio Nepal is useless for deaf people due to hearing disability. A visual program transmitted by Nepal Television looks effective and fruitful but it is available only in some districts of the country and general Nepalese people cannot afford television set. Similarly, most of the parents are not conscious about cause and remedies of deafness. So the only mean to aware such people are to provide door-to-door awareness program. NADH is always making effort to solve the above-mentioned problems and difficulties. But due to the lack of reliable economic sources, it is not able to do this. Here are some of the activities conducted by NADH. Established five deaf schools in different five districts of the country. Conduct classes on Nepali Sign Language (NSL). We are looking for helping hands to launch other activities. Interested Organization and individual are heartily welcomed to help deaf and hard of hearing through NADH. NADH has planned the following activities to perform in future. Some of the activities in this list are on action. To create awareness in the villages of Nepal about deaf and hard of hearing people. 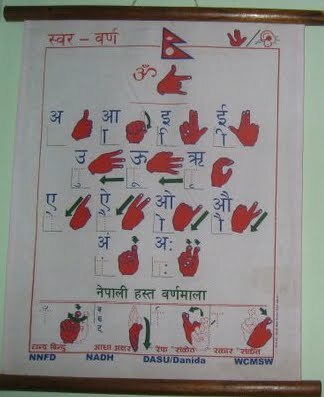 To conduct Nepali Sign Language classes in the villages for the deaf people and to establish deaf schools in places with relatively large size of the population of deaf children. To prepare curriculum for deaf schools. To print NSL calendar and magazines concerning deaf and hard of hearing people. To develop awareness creating movies, T.V. and radio program, to change the long rooted wrong attitude of the parents and society towards the deaf people. To develop posters and create awareness about prevention of deafness and broadcast it through communication media with the joint venture of government agency. To generate awareness among the deaf and hard of hearing people about HIV/AIDS and other dangerous diseases and about available methods of prevention through health training programs. To develop and refine the grammatical aspects of the NSL in order to bring it in line with the written and spoken Nepali language which is the official language of the government. To create door to door awareness program in the houses of deaf and hard of hearing people and convince the parents to provide equal opportunity and send their deaf child to the deaf school as they would the hearing child. To provide NSL, literacy class and skill training to the adult deaf to make them self- reliant. To create an environment for higher level education for the deaf and hard of hearing people, to look into the possibility of working in joint venture with Ministry of Education of Government of Nepal. To provide leadership development training for the capable deaf people in executive posts of the local and national level deaf associations. To increase awareness among deaf and hard of hearing people about human rights, their individual rights and their self-respect. To conduct meeting, workshops and seminars to highlight the problems faced by this community and draw the attention of government agencies towards the solution of the problem. To work for job placement of the deaf and hard of hearing people according to their qualification and ability, in different associations, corporations, hotels, offices etc. About 25 deaf people already have jobs in hotel, paper industry, airport etc with the effort of this association. To work to remove the communication barrier between deaf and hearing people. This association will try to provide interpreter's service in public related places hospitals, governmental offices and police stations, schools etc. NADH is of the Deaf, by the Deaf and for the Deaf.